Chewy, fudgy, gluten free brownies sprinkled with sea salt, what could be better than that??? Easy, fool-proof recipe that is also dairy free. There are 2 types of people in this world: Cake brownie fans and Chewy brownie fans. I love a good cake, but when it comes to brownies I’m all about the chewy, fudgy, dense and chocolate filled kind. I love the crispy edges and the ooey-gooey centers. 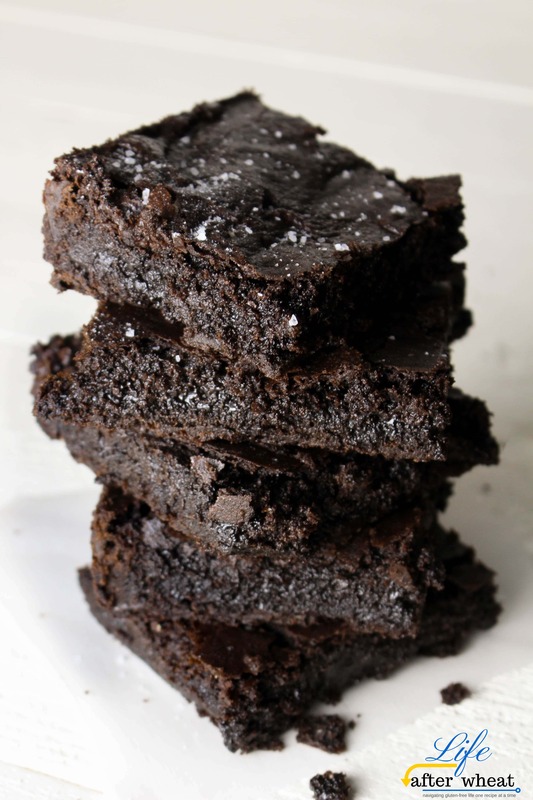 These gluten free brownies are perfectly chewy, fudgy, and decadent. 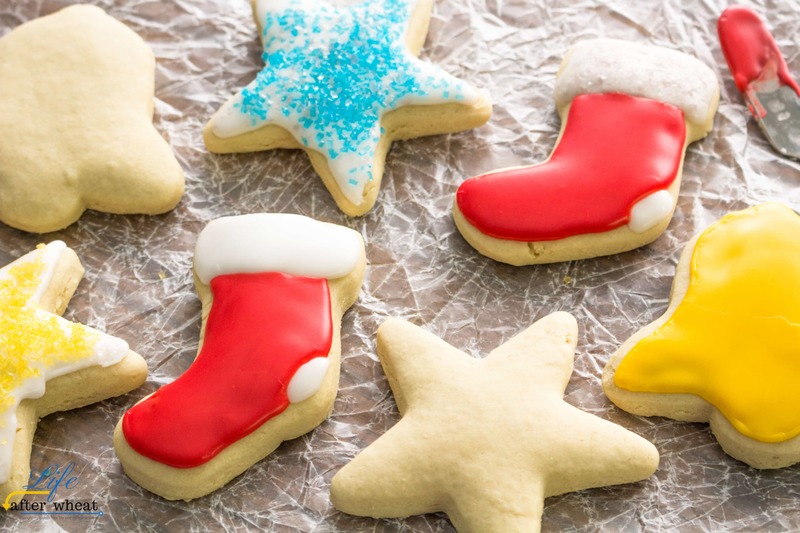 I have many great memories of food from my childhood (thanks for raising a foodie Mom!) My mom was known for her homemade bread, pizza, and (my personal favorite) brownies, which were made just the way I like them. 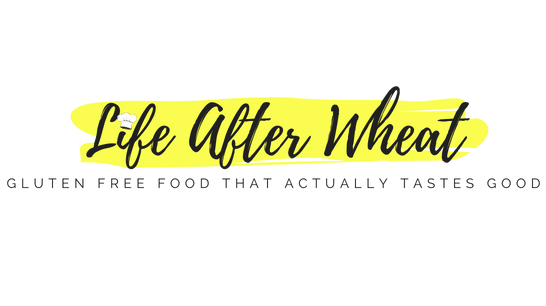 When we started eating gluten free 7 years ago due to a food allergy diagnosis, I knew we had to recreate my Mom’s recipe. 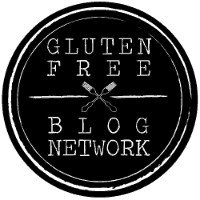 Many of you are fully aware that recipes don’t always readily convert to a gluten free version by simply switching out the flour. It can throw off the balance of things a little and some adjustments need to be made. 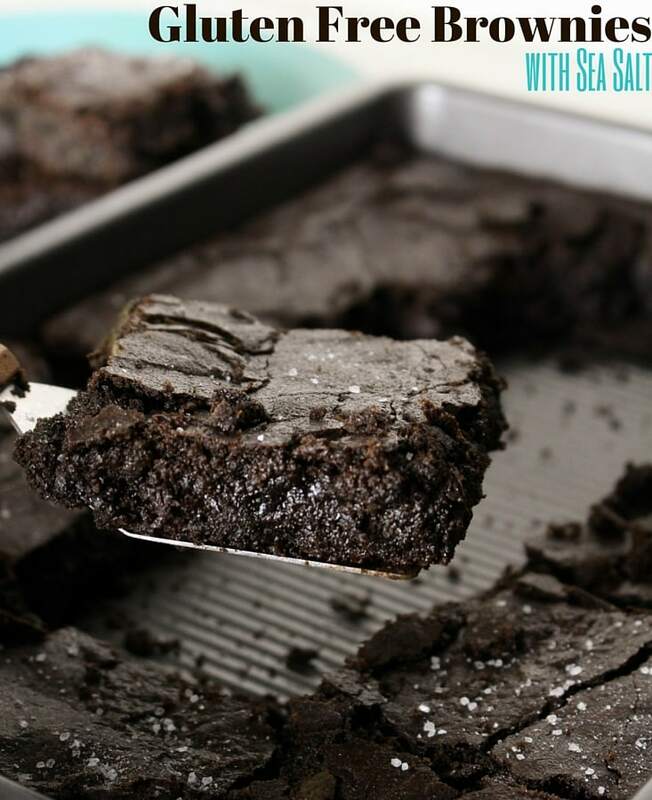 This recipe for gluten free brownies was no exception and I have tweaked it over the years until it is the perfect chewy, fudgy, and chocolate-packed brownie you see here. You will notice these are very dark, this is because I used half regular cocoa and half dark cocoa. You can do the same, or feel free to use all regular cocoa for a lighter taste and color. The rich chocolate in these brownies is perfectly offset by the addition of sea salt. These gluten free brownies are perfect on their own, or with a scoop of your favorite gluten free and/or dairy free ice cream. We served it up with Breyer’s gluten free Mint Chocolate Chip ice cream. The combo of cool mint, rich fudgy chocolate, and sea salt was absolute perfection. Do you love gluten free brownies as much as we do??? 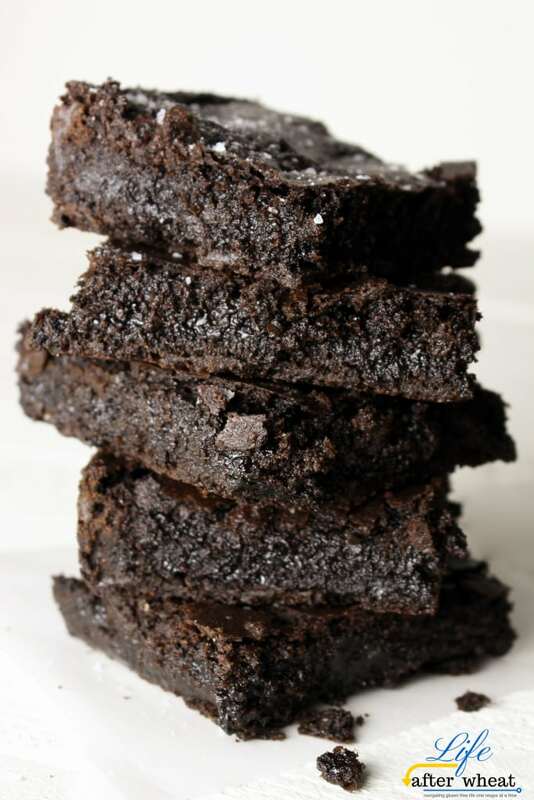 Try our Flourless Tahini Brownies! This recipe can easily by doubled and made in a 9×13″ pan. 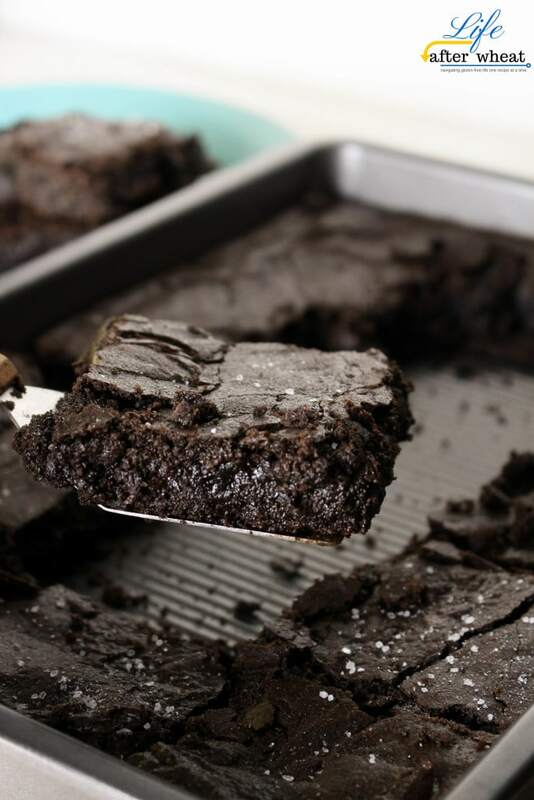 Be aware that these brownies are rich and a small piece will satisfy that chocolate craving, so making a square pan to feed our family of 6 is just right. For this photo op I made a large pan and we shared with family and friends. If the brownies are wrapped to protect from drying out, they will stay nice and chewy for up to 3 days after baking. My kids loved packing them in their lunch boxes! and Grandpa’s Kitchen with great results. If you try another, please come back and comment letting us know which you used and how it turned out! ALWAYS bake brownies until they’re almost done. If you want to ruin brownies, overbake them. I like them nice and fudgy so I pull them out when there are lots of moist (sorry!) crumbs and it looks almost battery. They will cook a little more as they cool. In a large saucepan over medium-low heat, melt coconut oil. As soon as it is melted, add neutral oil and cocoa powder and whisk until smooth. Add sugar and stir until fully combined. Remove from heat. Add eggs and beat with a spoon until smooth and eggs are fully combined with the cocoa/sugar. Add gluten free flour, xanthan gum, and salt and stir until smooth. Spread into a greased, square cake pan. Sprinkle with sea salt if you want. Bake at 325 for 20-25 minutes, until a toothpick inserted in center comes out with very fudgy crumbs. Mine were done right at 20. Be careful not to overbake! You should take the brownies out of the oven just before they seem to be done, they will cook a little more as they cool. and Grandpa's Kitchen with great results. If you try another, please come back and comment letting us know which you used and how it turned out! ALWAYS bake brownies until they're almost done. If you want to ruin brownies, overbake them. I like them nice and fudgy so I pull them out when there are lots of moist (sorry!) crumbs and it looks almost battery. They will cook a little more as they cool. They look so ooey gooey and delicious!! I’ll take the whole pan! Yum! These looks so chocolaty and fudgey! Oh my goodness these look amazing! I’m craving brownies now. Yum! It’s a daily thing for me Emily, hahaha! Oh my! I love brownies, and these look perfect!! Me too Bethany! Hope you love them! My husband would love these, they look so rich! I totally want to try these! They look amazing! 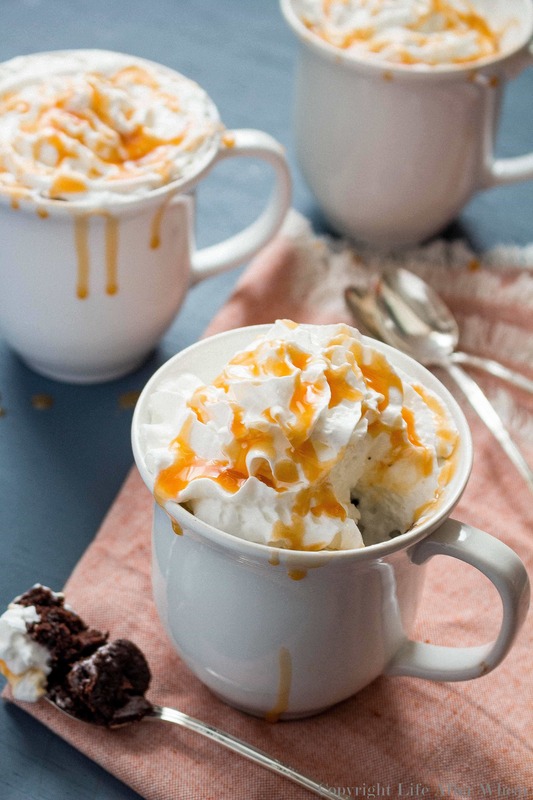 These look both amazing and really simple to make. Mint chocolate chip ice cream sounds like the perfect addition. Yum! These look so rich! I love having the tips. I had to laugh, though. If they don’t cut when they are warm, no problem. Just grab a spoon! Great thinking Amanda – problem solved! 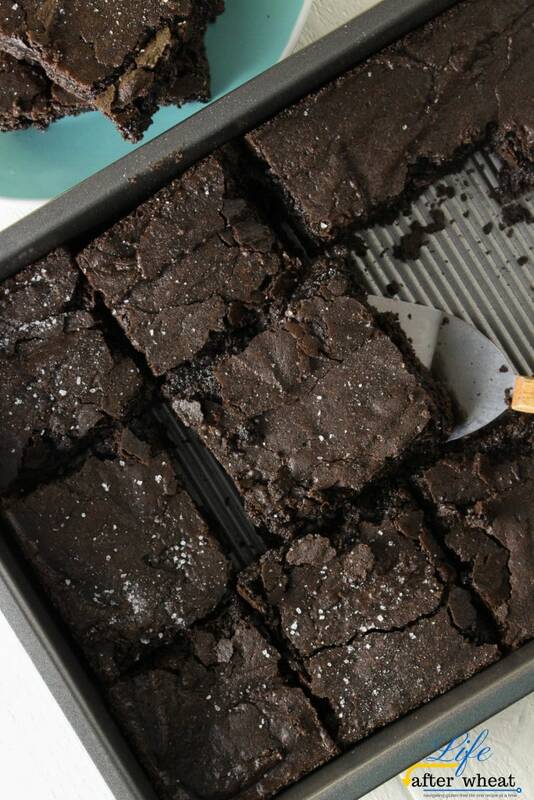 Absolute words of wisdom – DON’T OVERBAKE THE BROWNIES! Love how dark and rich these look.